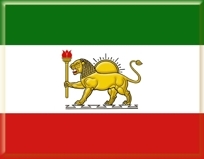 The sword carried by lion, it does not represent Iranian characteristics. in Persepolices and other engraved historic monouments. What is suggested here it represents, Torch of Freedom, knowledge, liberty, energy, peace and integrity. Please be patient for flash show to load.